"The Seven Deadly Sins" is an upcoming anime based upon the manga by Nakaba Suzuki. Here is a 30-second preview of the Mamoru Miyano-voiced Holy Knight Gilthunder and the rest of the series from the makers of the show, A-1 Pictures. The theme is Ikimono-gakari's "Netsujō no Spectrum." Tensai Okamura (Darker than Black, Blue Exorcist) will be directing the fall A-1 Pictures (Blue Exorcist, Magi, Sword Art Online) production, with Shotaro Suga (Darker than Black, Ghost in the Shell: Stand Alone Complex) on series composition. This will air on Crunchyroll, the website that beams over anime productions. The television anime will premiere on October 5, 2014. Here is a general plot. It involves a wronged princess and warriors who decide to avenge an injustice against her. Naturally, they are just plain folks who actually have hidden abilities that outclass anything anyone else has. No, we've never seen anything like this before. "When they were accused of trying to overthrow the monarchy, the feared warriors the Seven Deadly Sins were sent into exile. Princess Elizabeth discovers the truth - the Sins were framed by the king's guard, the Holy Knights - too late to prevent them from assassinating her father and seizing the throne! Now the princess is on the run, seeking the Sins to help her reclaim the kingdom. 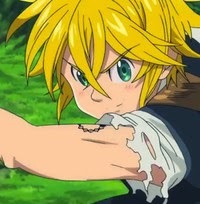 But the first Sin she meets, Meliodas, is a little innkeeper with a talking pig. He doesn't even have a real sword! Have the legends of the Sins' strength been exaggerated?"